I'm a parent who is always eager to explore the App Store to find great apps that can enrich the learning journey of my juniors. At the same time, I'm also open to suggestions from readers and developers on apps that are worthy for consideration. This time, Mithun Jhawar, a member of StudyPad, suggested a workbook app that they developed to help first grade students to learn and practice math concepts introduced throughout the school year. As a math geek, I know by experience that "practice makes perfect." Working through a workbook with endless number of problems can really help hone your skills. But, in this iPad era, it would be great if instead of physical workbooks, we can have apps to help us instead. Splash Math - Grade 1 is a workbook app that provides math exercises for your juniors throughout their first year at elementary school. The app is developed based on the Common Core State Standards for Mathematics, and is available for both iPhone and iPad. The app is broken down into 13 chapters, ranging from simple addition and subtraction to the concepts of graphs, time, money and geometry. Within each chapter, Splash Math provides easy-to-follow steps to help your juniors learn and understand a math concept. As a parent, you can tweak the settings for each step, i.e. the number of problems per set and its difficulty level. 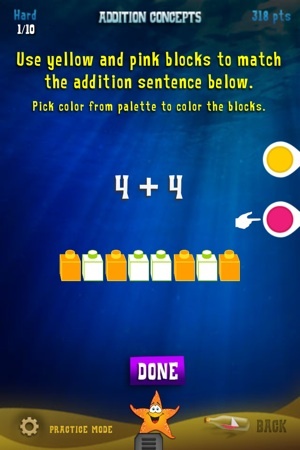 If your junior can finish the easy problems for a step, Splash Math automatically notices this and upgrades the difficulty level to normal (and subsequently to hard). Based on my experience while testing Splash Math, it took me about two hours to finish the entire Chapter 1 on addition. This includes 6 sub-chapters and more than 200 problems that range from easy to hard. It is safe to say that the lifetime of Splash Math for your juniors is at least one full year. In order to balance studying with playing, Splash Math includes a fun reward system; when your junior finishes a problem set, the app reward him with an adorable sea creature which can be kept in a virtual aquarium to play with (hence the name Splash Math). This makes it possible for the app to be used all year long without boring your juniors. Because Splash Math is designed to work properly even after a long period of time, the app needs to be able to track how far each user has worked through. It needs to track which concepts your juniors have mastered and how much they have progressed within the app. After speaking to the developers of Splash Math, I learned that they anonymously backup these data to their servers (without sending any personal information), so that they could provide a restore feature for the parents in case there's an data loss issue. If you're concerned about this, you can always turn off the backup switch within the settings menu. Splash Math also offers to send you, the parents, a weekly e-mail report detailing how your juniors have progressed through the app. The level of details in the report is exceptional, and I believe most teachers would benefit a lot from this. After trying out the math problems available in the app for many hours, I can safely say that Splash Math does a great job designing them. The range of problem types is quite wide; your juniors can find multiple-choice problems, essay-type problems, and even story problems. Splash Math also optimizes the touch interface really well. Problems are cleverly designed so they can be solved intuitively using simple gestures. Your juniors are required to tap to select, drag to move the correct options for each element of the math equations, and color items in a certain way to solve the problems. Sean wants to buy something for 10 cents. If he uses only pennies, how many pennies does he need? Which of the following shape has 5 sides? If your juniors are currently in elementary school, I highly recommend the Splash Math series. They currently have apps from Grade 1 to Grade 5. Based on my experience in trying out the Grade 1 app, I think this series offers the best math workbook apps in the App Store. Try it yourself and see the great value of Splash Math. Even I learned a thing or two from it.